Jan Pokorný, Jr., Blahoslav Mar?álek, Stìpán Srnka, Jaroslav Svehla,Jan Bastl and Jan Pokorný, Sr.
Phytoremediation Treatment System for Landfill Leachate. Will Fish Pond Management Principles from the Temperate Zone Work in Tropical Fingerponds? In 1994, Jan Pokorný and myself decided to organize a workshop on nutrients in constructed and natural wetlands. The major idea behind the workshop was to invite researchers and scientists who work both on natural and constructed wetlands so they can exchange their experience and gave them a lot of room for discussion. We picked Tøeboò as a venue because wetlands had been studied here since late 1960s. The first workshop took place on September 6 to 9, 1995 and it was organized by Institute of Botany of the Academy of Sciences of the Czech Republic. The event was attended by 33 people from 10 countries from Europe, North America and Australia and 22 papers were presented. All papers appeared in a proceedings Nutrient Cycling and Retention in Wetlands and Their Use for Wastewater Treatment edited by J. Vymazal. The success of the first workshop encouraged us to continue in organizing such events in the future. The second workshop Nutrient Cycling and Retention in Natural and Constructed Wetlands was organized on September 3-6, 1997 again at Tøeboò by Institute of Botany, Wetland Training Center and myself. It was attended by 29 people from 9 countries and 18 papers were presented. Out ofthose, 16 papers appeared in a book published by Backhuys Publishers in Leiden in the Netherlands. In 1999, we decided to move the workshop from Tøeboò and the third workshop Nutrient Cycling and Retention in Natural and Constructed Wetlands III was held on September 14-19, 1999 at a forest hotel Per?lák near Jindøichu°v Hradec, close to Austrian border. The workshop was attended by 35 participants from 13 countries and for the first time a representative from Africa took part in the event. Twenty five papers out of 27 presentations were published in a book Transformations of Nutrients in Natural and Constructed Wetlands edited by J. Vymazal and published by Backhuys Publishers. This time we made the theme of the workshop broader and added also water balance in wetlands, wetland restoration and ecological functional assessment of wetlands. We also decided to tape the discussion and included it in the papers. The fourth workshop returned to Tøeboò and it was organized on September 26 to 29, 2001 by Institute of Botany, myself and NGO ENKI, o.p.s. The workshop was attended by 31 participants from 13 countries from Europe, Australia, North America and for the first time also from Asia and South America. 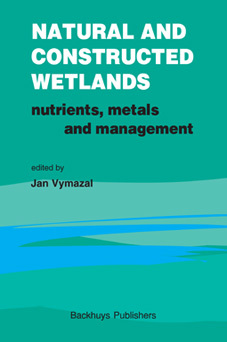 The book Wetlands-Nutrients, Metals and Mass Cycling edited by J. Vymazal and published by Backhuys Publishers, included 21 contributions out of 30 papers which were presented during the seminar. The theme of the workshop was again broader and included heavy metals retention, removal and compartmentalization, reed beds for sludge dewatering, the influence of watershed management on mass cycling or the use of GIS for wetland evaluation. This volume resulted from the workshop entitled Nutrient Cycling and Retention in Natural and Constructed Wetlands V which was held at hotel Babu°rek near Borová Ladain the −umava Mountains on September 24 to 27, 2003. The workshop was organized by ENKI o.p.s. and myself and was attended by 42 people from 16 countries from Europe, Asia, Africa, Australia, North and South Americas. The organization of the workshops 2001 and 2003 was supported by grant MSM 000020001 Solar Energetics of Natural and Technological Systems from the Ministry of Education and Youth of the Czech Republic This time we selected the title Natural and Constructed Wetlands - Nutrients, Metals and Management in order to cover topics of the workshop. The volume contains 28 peer reviewed papers out of 32 which were presented during the workshop. Discussions are included in the form they proceeded during the workshop no matter if the questions were took inconsideration during the final preparation of the manuscripts. There is no discussion on the paper by Michel Radoux because the paper was not presented in full during the workshop.I want to thank all contributing authors for their effort throughout the preparation of the book and the publisher, Mr. Wil P. Peters, for his excellent help during the process of book edition and his continuous support of this workshop publication series since 1997. Finally,I would like to thank my good friend Dr. Jan Pokorný, director of ENKI, o.p.s., for his help, co-operation and continuous support of these workshops.